Maybe he will become a treehugging environmentalist or maybe he will decide he hates trees when he’s older, but for now, Birch is dressed in birch a lot of the time! Kate Quinn Organics had a big 40% off sale and I bought all of the birch fabrics in different sizes. I had to! I was on the hunt for a backpack diaper bag and this one by Parker Baby caught my eye for its style and colors. I then learned it was called The Birch and of course it became The One. 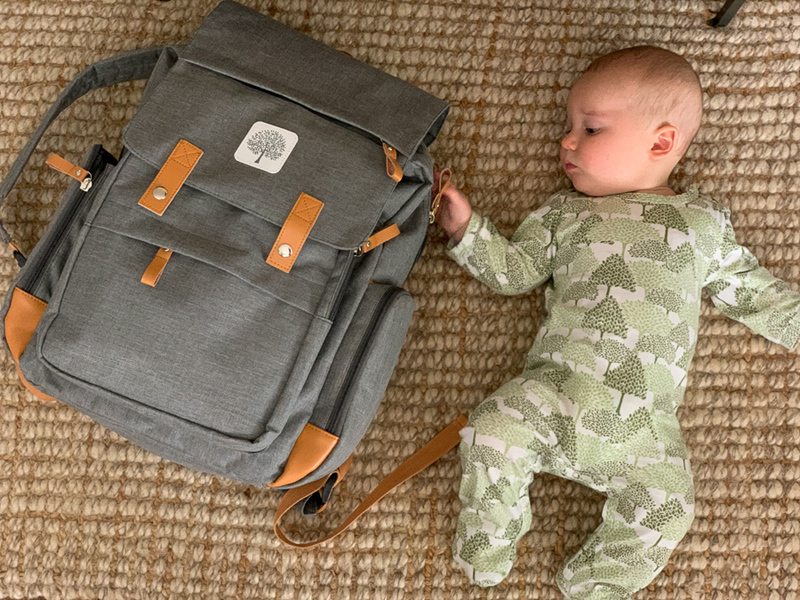 I am absolutely obsessed with it, from the little tree that matches my baby to all the perfectly positioned pockets. 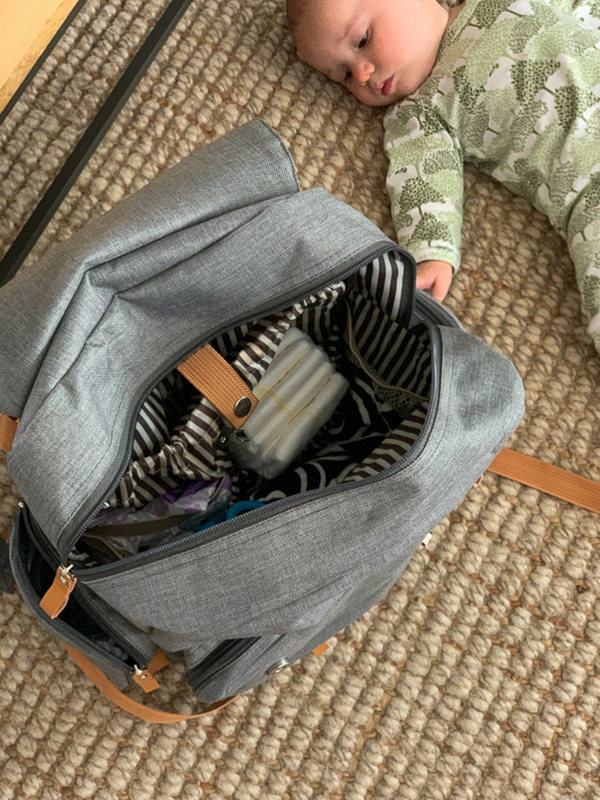 I have never had a backpack diaper bag before, and now I see what all the hype is about! It’s SO much easier to carry around. Unlike my Skip Hop messenger bag, which was always spilling things out of the open pockets, this one is all zipped up. 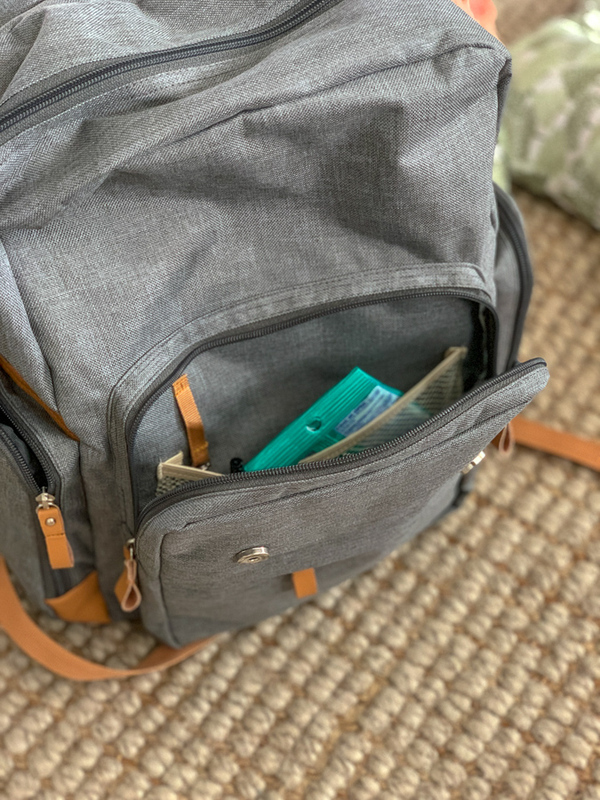 And best of all (seriously this is a game changer…) the side pockets, which are insulated for bottles, FITS MY GIANT HYDROFLASK WATER BOTTLE! (I just leave the zippers open across the top and slide it in.) I love the look of the bag so much too – I even took it to a meeting last week. I made a big announcement on Instagram Stories on Tuesday that I am excited to be joining the Beautycounter team! (Watch those stories online here!) Let me tell you how this all unfolded. Over the years I have gotten dozens of invitations to join Beautycounter. Every time my response was simply: “The timing isn’t right, but maybe in the future!” I love the what the company stands for – advocacy for safer skincare – but I just didn’t have the time to commit. As the founder and CEO, Gregg, says “I didn’t know what I didn’t know.” I should have purchased products back then because I’m sure my skin would have thanked me, but with a gazillion samples in my house, I felt obligated to use them up first. Ironically I have bought samples of Beautycounter products to take with me on trips, so the company’s own samples were bulking up my stash! I had a box of those samples with me on our spring break trip, and while I was in the shower using the, I started thinking about the company and how my mom gifted me some of the Beautycounter mineral sunscreen a while back and I should order more. This was particularly fresh in my mind because we had just bought all the cheapest (toxic) sunscreens at the Publix in Marathon, and I was already feeling guilty about putting them on Birch and me while breastfeeding. The skin is the largest organ, ya know? I decided right then I wanted to order more of Beautycounter’s mineral sunscreens when I got home. As soon as I got out of the shower, I saw that I had a DM from Teri of A Foodie Stays Fit (we go way back!) who happened to be at the Beautycounter conference asking me if I had ever considered spreading the safer skincare message. How about that timing, Universe? All that to say, I felt called to explore this opportunity. I spent a lot of time learning about the company and interviewing several consultants, and decided to place a (very large – gulp!) order of products and invite you guys to follow along as I try them and learn about what makes them both safe and effective. While my interest was piqued by wanting cleaner skincare for me and my boys, it’s no secret that this is also a business move. Yes, consultants make money through affiliate sales. I am not doing this simply to make money – I already have a business – but if getting to buy, try, and use great products helps my business grow, I’m all for it. So does that mean everything’s gonna be “aahhhhmazing” and you’re just going to try to sell it to us? I also decided that the best way to communicate with those of you who are gung-ho about this is via a Beautycounter newsletter. So while I will be writing some posts and talking about the products on the blog, naturally, if you want to hear all the deets, please subscribe by clicking this button. Be sure to indicate by checking the boxes if you’d like to get posts by email, the KERF newsletter, or only the Beautycounter newsletter. A lot! The products I’m really excited to introduce to try are the famous Dew Skin Tinted Moisturizer (which has SPF) and the Overnight Resurfacing Peel. People swear by both! The Countersun Mineral Sunscreen Stick will be perfect for soccer games and both Mazen and Birch. And I am hoping both the Resurfacing Peel and the No. 1 Brightening Facial Oil will help with the blotchy skin on my forehead I have leftover from pregnancy. 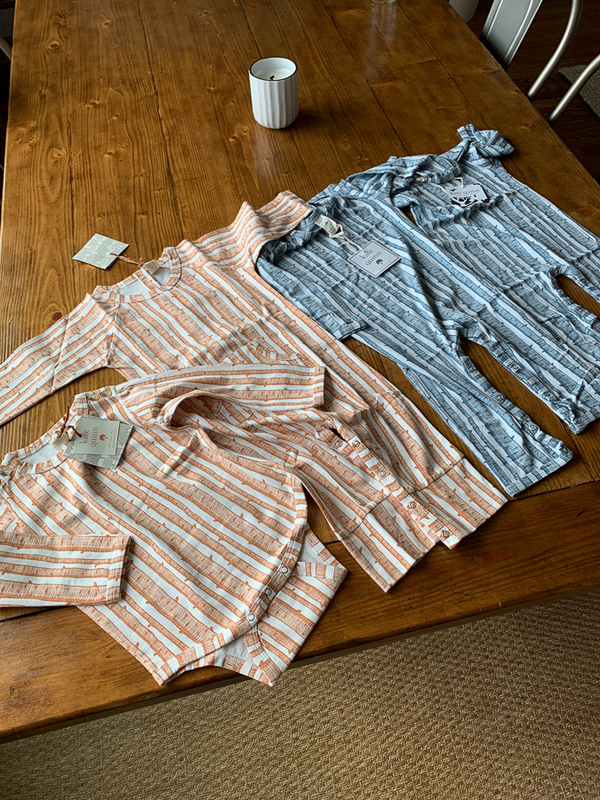 I ordered the Countermatch Collection for the basics: shower to bedtime. I ordered some make-up items too, which are the most fun part, and I already love the Color Intense Lipstick (in 9 To 5) which much to my surprise had a peppermint tingle (!!) and was still there when I glanced in the mirror after eating dinner. I will be sure to check in with an update! Inspired? Everything is 15% off till Monday. The pricing isn’t *too* bad. I was recently gifted some Coola products and their tinted sunscreen goes on like silk. I love their motto; “From Farm to Face”. I love this blog but I really dislike multilevel marketing schemes such as beauty counter. “… according to a report that studied the business models of 350 MLMs, published on the Federal Trade Commission’s website, 99% of people who join multilevel-marketing companies lose money.” What bothers me most about these companies is that they especially take advantage of women (and ESPECIALLY stay at home moms) because the model is so misleading and it encourages women to invest in a business that does not see returns once you account for time and money spent on inventory and sales. The company benefits when you take on consultants but at what cost to the women that sign up? Companies such as Lularoe and Herbalife have come under huge legal fire for the ethics of the MLM business model. It seems innocent enough, but when you understand how the model truly takes advantage of its consultants, its horrifying. There’s a documentary about Herablife that is particularly interesting. I know I’m a little fired up about it, but I HATE to see large companies take advantage of women’s valuable time and desire to work hard for their families. I still support this blog and your other content, but definitely can not get behind the MLM machine. I appreciate your comment, and I know that not all companies are built with integrity. Beautycounter is actually not a traditional MLM network marketing structure – it is direct to retail. The consumer can shop from multiple channels, including directly from the website and not even through a consultant. 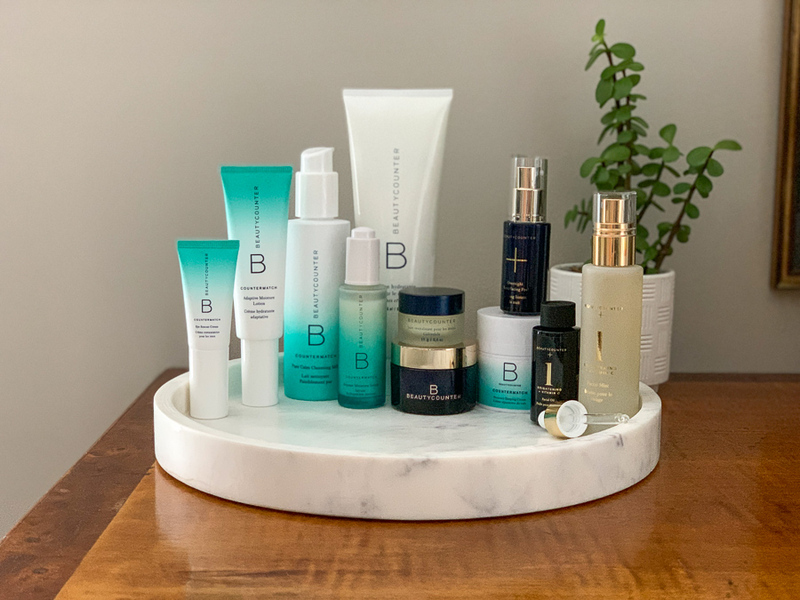 What’s also different about Beautycounter is that you don’t have to maintain an inventory, you are not ever required to buy any products, there are no auto ships, no product purchasing requirements and no sales quotas. I’m assuming those are all of the ways you’re saying the other companies take advantage of their consultants. 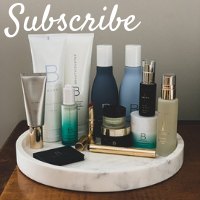 The only investment with Beautycounter is $98 consultant start up kit (which also comes with two free full size products! ), and if you’re a really good businesswoman you could technically sell it without spending another dime. It’s actually set up more like affiliate marketing but with far better compensation. As a long time reader, I am really bummed out that you joined an MLM. 🙁 I don’t care how great the products might be, the MLM business structure is predatory and the vast majority of people who sign up (those without blog platforms and built-in customer base!) lose money. I’d encourage anyone thinking about joining Beautrycounter to do their research and check out their financial disclosure statement to see how much people REALLY make. Kath, thank you for publishing my above comment. I’m glad you’re willing to allow this kind of discussion on your page. I have to respectfully disagree that it isn’t predatory—I see a LOT of Beautycounter sales pitches where bloggers are telling their readers that there is “no limit” to how successful they can be as Beautycounter, and that they “get out of it what [they] put into it.” I could see someone who is struggling financially signing up, thinking that if they just work hard enough, they’ll be successful. As we see from Beautycounter’s own income disclosure statements, this is simply not true for the vast majority of consultants. 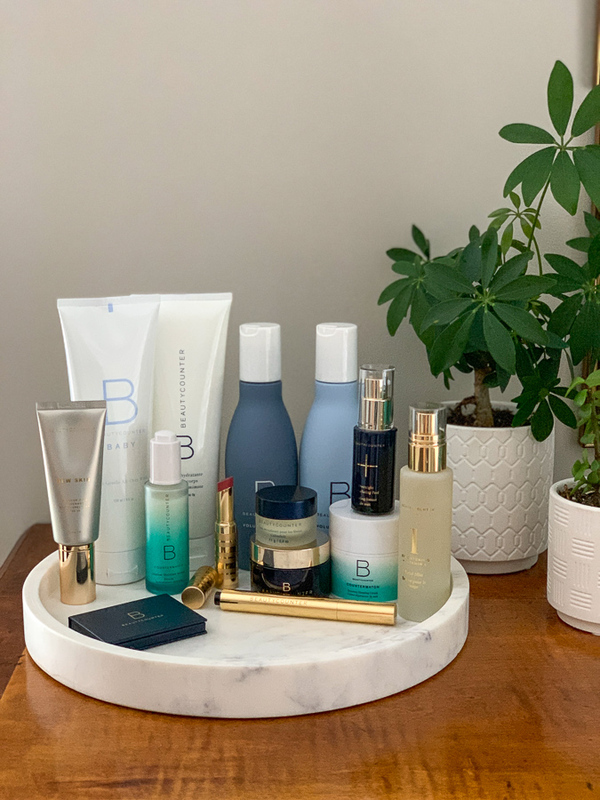 Aside from this, Beautycounter in particular seems to have absolutely taken over the social media platforms of many bloggers that I once very much enjoyed following (A Foodie Stays Fit and Fitting it All In have SO MUCH Beautycounter that I had to unfollow them). I enjoy your blog and I sincerely hope that won’t be the case with KERF. Good discussion. I am incredibly disappointed in the MLM industry. Beauty Counter has hidden their involvement, but the structure is the same underneath. Best wishes, Kath. Is Beauty Counter sunscreen safe for coral reefs? I’ve been buying a “reef safe” sunscreen because I read that some sunscreens are damaging to reefs. Yes! They don’t use Octinoxate or Oxybenzone, ingredients known to contribute to the collapse of coral reefs. I’ve bought a few BC products in the past (sunscreen!) and you have me inspired to buy some more for my face. I love the “vote with your dollars” angle. I’ve heard of Beauty counter but didn’t know anything about it until now. It seems like a company with a good mission behind it. I’ll look forward to hearing more and your reviews! Hi Kath, long time blog reader here. I really have enjoyed reading your blog over the years and I haven’t had a strong opinion about how you format your blog and what topics you’ve covered as you’ve changed throughout the years, mostly I’ve enjoyed it all. But I have to be real with you, I hear that you’re insisting Beauty Counter isn’t MLM so I’ll trust you on that. But I’m already skimming sections going into detail on products and skipping your stories … You sound like an MLM saleswoman in a way your sponsored posts rarely do. I thank you for your years of working on this blog and I admire you for building a lovely business that I enjoy consuming content from. I’m just not so excited about content related to your makeup sales business. Be careful! You mentioned that there are no sales quotas with Beautycounter. Well, technically true, because they use the term “activity requirements” instead of “sales quotas”. In order to maintain consultant status, you have to meet a certain sales volume every six months. Yes, it can be in personal purchases, but yikes, I don’t think you’ll be keen on spending that much on products all yourself! We’re looking out for you! Please ensure you understand everything about what you opted into. I absolutely asked all the questions before signing up and honestly the 1200 activity in six months is not much at all, even for a home-based business. Okay, I’m glad you’re comfortable. Part of the issue that many here have with MLMs is that it’s not transparent, or people feel like those who buy in are being duped by unrealistic promises. You specifically said in your post that there aren’t sales quotas. But very specifically there are with BeautyCounter at exactly $1200 every six months. Thank you for responding to the comments here and engaging in the discussion. Over the years. I, along with at least half a dozen friends, have had different luck with Beautycounter. It absolutely is MLM, but i do understand and respect that many bloggers choose to profit off this type of business. I love Beautycounter products & the mission of the company & wish you success, which I’m sure you’ll have! I have been seeing Beautycounter everywhere lately but haven’t yet pulled the trigger. Maybe now is the time! I’m going to go check it out. Looking forward to following your journey and after having followed you for so many years, I trust your opinion and know that you’ll give us all an honest and open review of everything! Congrats on the new endeavor! Hi Kath – I have to echo some of the comments above that I read this with some hesitation. I do see your point that it does not require consultants to keep a minimum inventory. Based on my relatively quick search of the website (which is a bit confusing to read and it hurts my heart a little bit to think about individuals who might sign up without being able to fully understand and comprehend what they’re reading) – it does look like consultants must meet an avg monthly sales goal of $150 to keep their status. That is $1800 annually, while the average income a consultant makes annually is $960. I would also deduct the $98 required startup fee from that. It also looks like there is an annual fee around $50 so that should all play into the bottom line. I know you like to crunch numbers, so it would be interesting if as part of your review, you kept track of your time put into building your business and the average amount you’re making per hour. I do also understand that from your perspective, you have a platform which likely makes this a better business decision for you. I would hope you would keep that in mind if and when you invite people to join in the journey that their results might not be typical. I understand that nearly any job is going to take some sort of investment be in education or otherwise, but I’d be mindful of being so sure that it is not built in a predatory model. Their wiki page says ther are 25,000 consultants. One of the things that was raised in the podcast The Dream (highly recommend! although I’m sure that it might be a bit bias) is to think about the ratio of consultants in a company to overall market saturation. If you’re thinking of this as a traditional business – ask the question of whether 25,000 consultants seems like a realistic number to have in the market. (I honestly don’t know) – but if it seems too high, is the company truly sending up their consultants for success? And if it’s logistically impossible to make a true income – is that predatory? I know I sound preachy, but if facebook has taught me anything these last few years, it’s that these models absolutely target women and SAHMs and it doesn’t seem like it typically meets their expectations in the end. And while your risk may be minimal, I would give it some thought given your platform as to whether your participation legitimizes a model that isn’t setting up most of your fellow women/colleagues for success. Would very much encourage listening to The Dream! I would encourage anyone who is interested in becoming a consultant to speak to actual consultants rather than just skim a website before signing up anyways. I’m not sure where you read the $150 a month thing but that is not a requirement. This is on the FAQ page: In order to maintain active Consultant status, you must meet the following requirement: 1,200 in Qualifying Volume (QV) every six months. This amount includes your personal orders and sales to Clients and Members. Those Consultants who do not meet their six-month activity requirement will be repositioned to Band of Beauty Member status. So I guess it depends on interpretation of requirement. No one is forcing you into the $150 thing, but you would lose your status otherwise. If I’m not understanding this correctly, I would be happy to be corrected. And I’m aware that this might sound curt, but it seems like asking a consultant (that will inevitably financially gain from your joining) is not the one stop shop for information. We love that diaper bag. We have it in gray and cream. It’s stylish with plenty of room for all of baby’s needs. 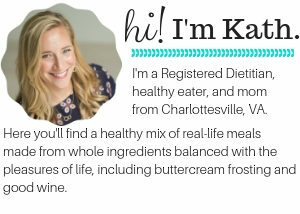 Why are all my favourite bloggers turning into BC consultants!? 🙁 I know that blogs have changed and you guys need to make money, but I wish I could just enjoy content and not feel like I’m being sold stuff all the time. I’m sure BC is fine stuff, but I find it expensive and I feel like I can find equally good products at my health food store. Just my 2 cents! I was just thinking…I know you love Survivor – do you listen to Rob Has A Podcast? He talks about how people can opt to pay a bit each month to become a ‘Patron’. It’s a way to support – I wish something similar existed for blogs! I have a friend who sells with another company and she is actually very transparent that her business has enabled her to stay home with her kids. She often says “If you could buy it from a drugstore or buy it from me, why wouldn’t you want to support me?” People often have a lash-out reaction to buying from friends (online or in real life) that are selling things, but I think as long as the person is respectful, not too pushy, and it’s something you will actually like and use, why wouldn’t you want to support them? Honestly I used to have a similar lash-out “I can buy it MYSELF!” response and from following my friend I had a total change of heart. 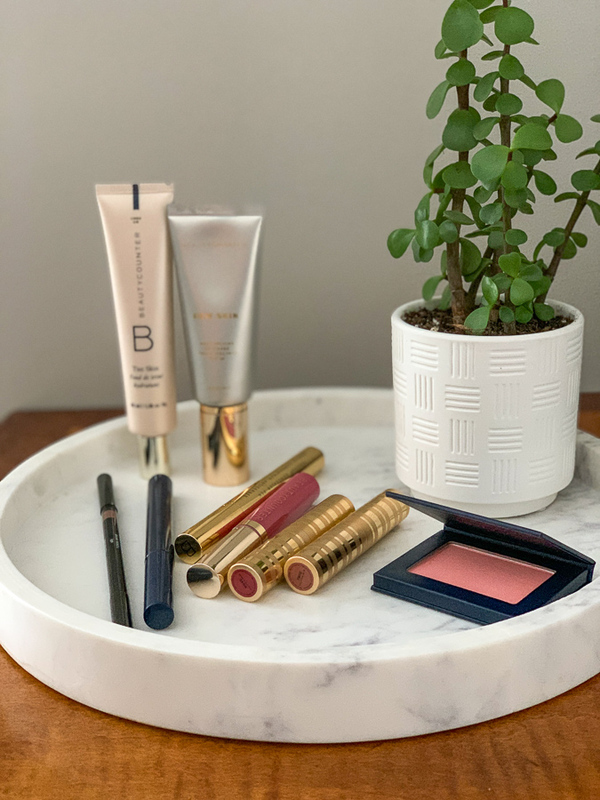 I think this is partly why I decided to join the Beautycounter crew – because I changed my own opinions about anyone trying to make ends meet in a non-traditional way, especially moms who want and need a flexible career. The problem with Patreon for a busy mom like KERF is that usually you provide new and exclusive content and/or “perks” to your patron subscribers (like Facebook live hangouts, ebooks, etc). I don’t want to speak for her, but it sounds like at this stage in her life that might take a lot more unavailable time and effort than just pushing BC products through Instagram stories. Although, providing recipes to Patreon subscribers or nutrition plans could be neat and would fit with the blog’s stated purpose! 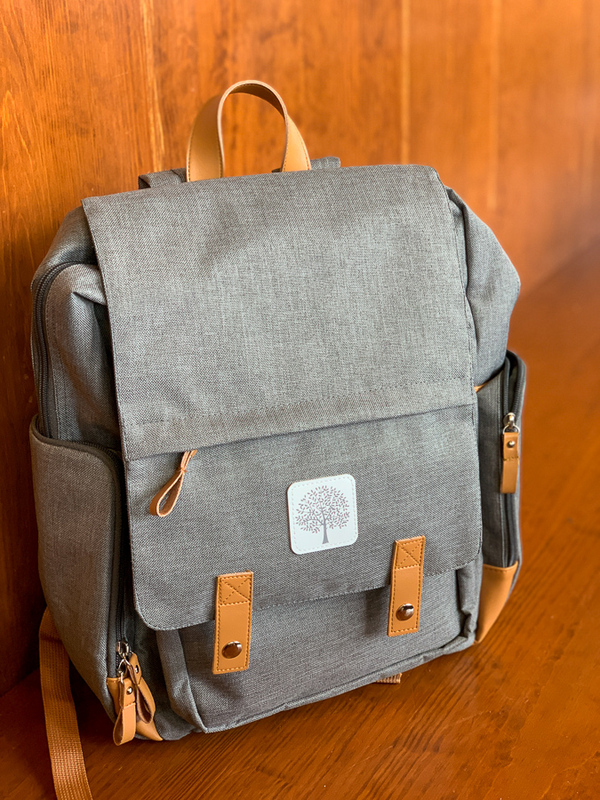 I am so happy to see your review of the Birch bag! I put the exact same one on my registry a few weeks ago but hadn’t heard how anyone in “real life” liked it. I am due with #2 and will also be switching to the backpack diaper bag so I can have more hands free. Thanks for sharing this tidbit!! I purchased their spray sun tan lotion through you. I love their sun tan lotion. I was running out and we are going on a cruise in two weeks. If you have never tried their spray sun tan lotion, you need to. Best product! I have it too! Thanks for ordering. Ps. Oooh good luck with your new venture. 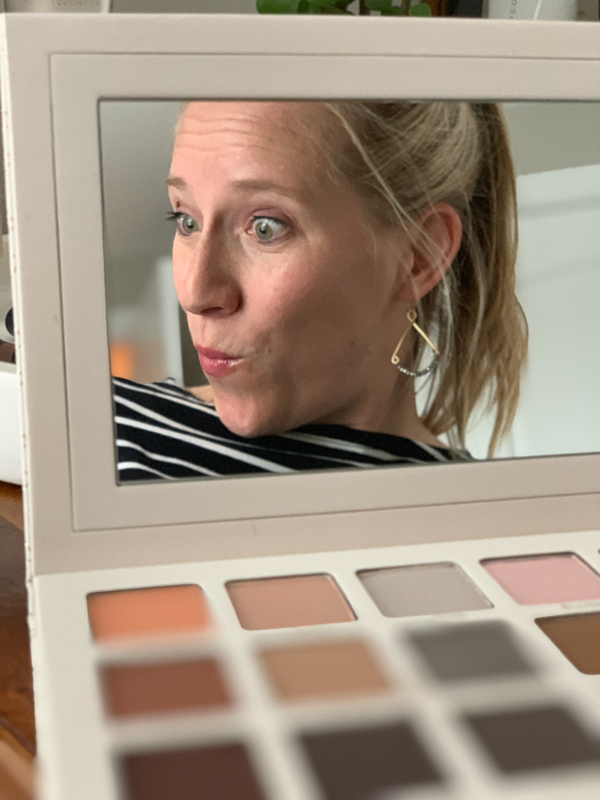 I’m interested in trying the products, and I am glad to read that Beautycounter is not just your typical Pyramid Acheme like so many of these other things out there- Lularoe, Beachbody etc… I am interested in trying some of their products. Thank you for PLEASE never using those sunscreens in the ocean ever again. Our country needs to take care of our planet and regulate that stfff more- as a scuba diver it’s so heart breaking to see our reefs bleaching and entire species disappear long forever. In hawaii they have banned all toxic sunscreens and take it very seriously. I was so lucky to see a price of 8000 year old black coral in Maui. It probably couldn’t survive in the Keys the way tourists treat the oceans. Thank you Kath! Yay BC! YES, SO INSPIRED !!! I’m on the exact same page as you in regards to taking care of “the biggest organ.” Personally, I approve of the ingredients list from what I’ve seen on their website so I’m game to give it a go. I’ve also been a reader for like a million years, so I’m excited to try a KERF approved product. I don’t have a daily SPF and it’s been on my mind; would you recommend the mineral sunscreen for under makeup? I would recommend the Dew Skin which is the tinted moisturizer plus SPF 20. It’s perfect for everyday/under makeup plus very light coverage. I think the mineral sunscreens are better for beach/heavier sun days! Where did you get that pretty marble tray for your products? It was a wedding gift! I believe this is the same one. YES to more natural products, especially ones we slather on our kids from head to toe. However, I’ve tried several SPF 50 mineral sunscreens and unless it’s midsummer and the kids have some color, they don’t keep my kids from getting burnt. We are from cloudy, cloudy Ohio and are fair skinned. We are in FL right now and I had to ditch mineral sunscreen. Anyone have one that works awesome?